Elemis Spa Light Candle Gift Set - £25.00 Look Fantastic - Filling your abode with a spa-like aroma, this soothing, calming candle housed in a silver, patterned frosted glass votive kicks out a Christmassy notes of orange, vanilla and cinnamon for a 40 hour burn time total. Cowshed Winter Candle - £28.80 Look Fantastic - Made from soy wax, all natural ingredients and hand-blended notes of uplifting, warming myrrh, jasmine and orange flower, this candle has got Christmas summed up in a beautiful ceramic votive with metallic gold detail - it comes out this time of year and at this time of year only and makes for a lovely treat to any Cowshed product lovers. 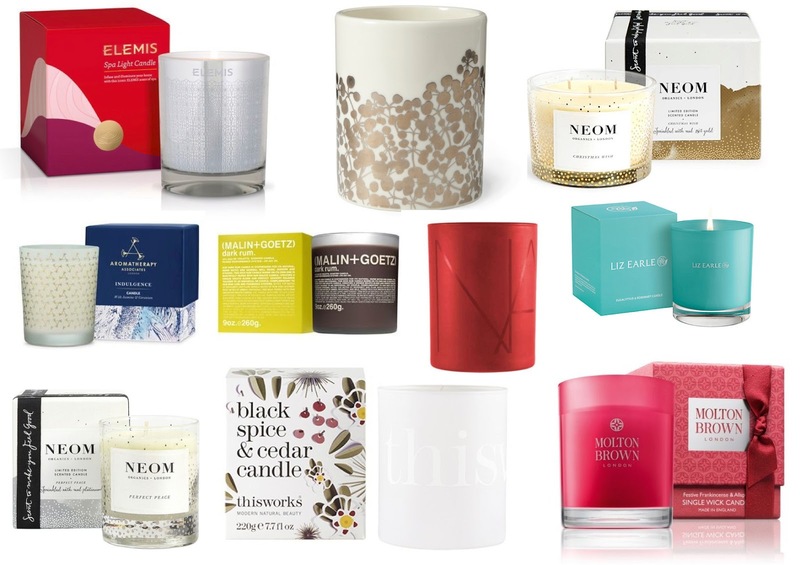 Neom Christmas Wish Scented Candle (3 wicks) - £49.95 Love Lula - Hear me out now, because if you're going to get any Christmas candle gift, you need to make sure it's this one. Made with only natural ingredients and vegetable wax and using 13 pure essential oils that include cinnamon, mandarin and tonka bean, Christmas Wish is by far the most festive candle I've come across. As part of the Scent to Instantly De-stress range, it helps reduce stress levels whilst bringing that comforting Christmas feeling - but if the three wick is too big, it also comes available in single wick form. Aromatherapy Associates Indulgence Candle - £36.50 Space NK - Scenting the air with essential oils of warming jasmine and geranium to envelope you in a indulging experience , this candle balances your senses. Made using soy wax, it burns for 40 hours long and comes pre-packaged in the most beautiful box. If your loved ones are into their AA oils, treat them to a similar scent that lingers even longer. Malin + Goetz Dark Rum - £37 Space NK - Available year round and suitable for any environment and occasion, this offering from M+G fits the bill just nicely for the festive period; top notes being plum and bergamot, rum as the middle note and the base balancing everything overall using vanilla and amber-patchouli to give your space a warming and modern ambience. NARS Jaipur Candle - £34.50 Look Fantastic - Encased in a crimson votive complete with NARS logo, the candy apple red wax burns for 60 hours strong. Blending citrusy top notes with crisp pomegranate balanced out by jasmine and geranium floral notes and a base of amber and vanilla, this candle kicks out scents of warmth but at the same time also has a sweet and seductive experience going on. Liz Earle Eucalyptus and Rosemary Candle - £40 John Lewis - Inspired by the same Cleanse and Polish HCC botanicals, this rosemary come eucalyptus candle makes for a festive gift for anyone who's a fan of LE skincare. Made from a blend of natural soy wax and enriched with the essential oils of said two scents, it too uses crisp, green notes at the top, woody, amber notes at the heart and a musky base - it's both calming and uplifting but promises to soothe and brighten your home not only at Christmas but year round, burning for 40 hours long. Neom Perfect Peace - £34.95 CultBeauty - Stepping in as the silver sister alongside the gold edition mentioned above, the Perfect Wish candle too uses natural vegetable wax encased in a silver snowfall adorned glass, burning for 50 hours and also comes in a three wick option. Creating a perfect, peaceful ambience to help lift spirits and relieve tiredness whilst kicking out that clean, crisp Christmassy feel with blends of pine, myrrh and lime peel. This Works Black Spice & Cedar - £25 Look Fantastic - Aiming to stimulate senses to leave you feel relaxed and refreshed, the blend of essential oils including cinnamon, myrrh, frankincense and cedar, makes this a super therapeutic candle with its woody, festive fragrance. Imparting a beautiful ombre glow to your space with a frosted white glass and wrap-around logo, it's definitely the most Christmassy of offerings to come from TW. Molton Brown Festive Frankincense and All Spice Christmas Ed. Candle - £36 Look Fantastic - Presented in a pre-gift wrapped pink box complete with tied bow, this option will infuse Christmas straight into your room by combining frankincense, all spice, vetiver and cedar wood to put out a woody, fiery fragrance. You can also currently bag 15% off with code LFSAVE, bargain!